Over running roadworks caused chaos for commuters using the A947 between Oldmeldrum and Turriff on Monday. Aberdeenshire Council had scheduled the resurfacing work at Hatton Lodge to take place between 9am and 4pm each day, allowing for the heavy commuter traffic to continue to use the road at peak times. On the first day of the resurfacing works the road did not open at 4pm as publicised leaving traffic, HGVs and buses using poorly signposted diversion routes. Signs showing the times of the closure had been altered, with the 4pm reopening time being blacked out, it was reported locally that the roads team had altered the signs thinking it would indicate to drivers that the road was still shut and for them to continue using the diversion route. There were reports of cars driving on verges, HGVs having to do U-turns on the A947 and the diversion routes being blocked with traffic. 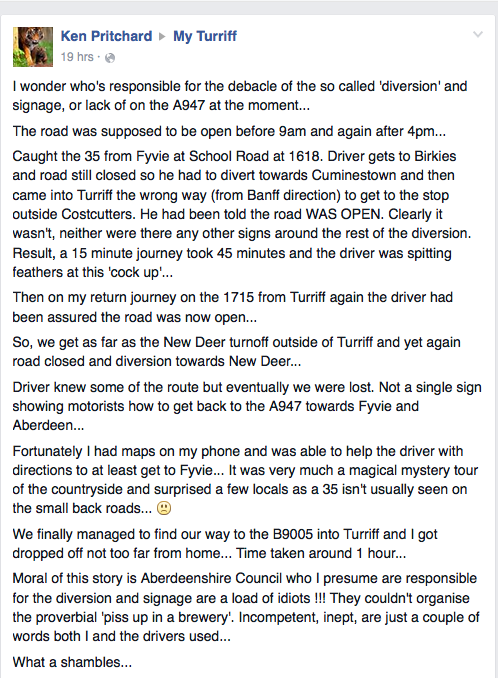 Fyvie resident Ken Pritchard wrote on the My Turriff Facebook page to express his dismay at the way the road works were being managed and that he had to use Google maps to help direct the bus he was travelling in around the lanes of Cuminestown. there have been lots of E-mails and phone calls about the roadworks yesterday and the head of service has been told that this must not happen again. The road must reopen at 4pm today, I will be going out myself to check if this happens or not. Aberdeenshire Council apologises for the delays on the A947 yesterday evening and regrets the undoubted inconvenience caused to road users. Unfortunately, removal of the old road surface took longer than anticipated, and the condition of the road was deemed inappropriate for vehicle use at 4pm, when the road was scheduled to reopen. While this decision was taken for all the right reasons, in hindsight we could have taken some different steps to mitigate the impact of the delay in reopening the road. The decision resulted in a high volume of vehicles being required to use the local diversion routes, which was a situation we had planned to avoid. This increased traffic flow did cause difficulties and I would again apologise for the inconvenience caused. Members of the public can be assured that the road will be open from 4pm, as planned, for the remaining duration of the works and that associated information signs accurately reflect traffic restrictions and diversions. We are happy to report that the A947 did reopen as scheduled this evening.